The Institute of Medicine estimates that every year up to 100,000 people die and 1 million are injured in U.S. hospitals because of medical error. Its 1999 report, “To Err is Human: Building a Safer Health System,” launched a movement toward patient quality, and “teamwork is at the heart of it,” says Iveris Martinez, an associate professor in the Department of Humanities, Health and Society in the Herbert Wertheim College of Medicine (HWCOM). That’s why, every year, Martinez and other members of the Interprofessional Education Planning Committee organize an interprofessional workshop that brings together faculty and staff from medicine, nursing, occupational therapy, physical therapy, speech-language pathology and social work. The committee is comprised of faculty from FIU’s HWCOM, Robert Stempel College of Public Health and Social Work, and Nicole Wertheim College of Nursing and Health Sciences. 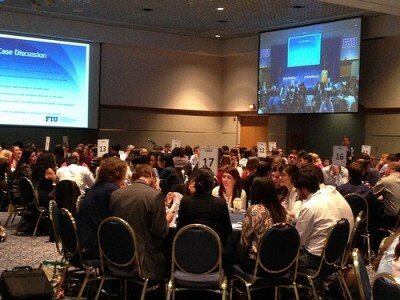 FIU health professions students learn that teamwork can improve patient care and even save lives. The 5th Annual Interprofessional Workshop, “Introduction to the Health Disciplines: Working Together to Make a Difference in Patient Care,” was held in the Graham Center Grand Ballroom. It attracted some 400 students who also got to learn from each other. That opportunity is crucial because health care professionals are often ignorant about the roles their colleagues play in patient care. Such ignorance is not conducive to good health outcomes and may even contribute to medical errors. “You might go through your entire professional training without meeting people from other health care professions who will be on your team,” says Martinez. “They have preconceptions based on what they see on television dramas. They watch Grey’s Anatomy and they think they know what the others do.” Even those shows focus mostly on physicians and nurses. How often is the main character an occupational therapist (OT) or a physical therapist (PT)? Do you know the difference? How can a social worker contribute to patient care? The idea behind the annual workshop is that medicine is a team sport, so students work in teams. They get to know each other’s capabilities and responsibilities. And they work on specific case studies as part of an interdisciplinary team for the benefit of the patient. “So that when they graduate they can walk out the door hopefully knowing how to be a team player and reduce the harm that can come to a patient when there is lack of communication and understanding among health care professionals,” says Martinez.